Over the last three weeks, I have viewed someone’s profile and they have sent me a note within a day. I clicked on one woman’s profile I haven’t spoken to in months. BOOM, hours later, I got a Linkedin message: “How’s business?” I love it. The idea here is very similar to what you do with marketing automation, ie, a prospect you have been pursuing or you haven’t seen in awhile starts spending time on your web page and you can see that is happening and you reach out. You can do this on the biggest b2b site in the world and you should. Think about it, you have someone who just took the time to click on a description of YOU. 2. Prospecting — trying to get a person on the phone, include your linkedin profile in your email. You will see them check you out and when you do…shazam. 3. Customer Nurturing — Avoid “checking in”. You see someone looking at your profile, they are thinking about you, reach out. The “How’s business” message I received falls into this category. Boom, you can see who is “checking you out”. Drumroll please … I present the 210 B2B marketing tips for 2010. Let me tell you, this was quite an adventure, one that I will certainly do differently in the future. Much of what you see below is attributed. Some, however, like the input from @scottalbro, were fed to me conversationally through stream of consciousness, so I didn’t attribute them. He is a great writer and would not be crazy about my translation. So, without further ado, here they are. I hope you enjoy them. BTW, if you are just starting on scoring, don’t get too extreme. Scoring means deciding which leads are better than others. Go to one of the following trade shows: Marketing Sherpa or Sirius Decisions. However, don’t think about immediate conversion, judge the show by important meetings had (could be with customers) and the “right” people. If you are looking at short-term conversion rates, you will cancel them all. Re-evaluate your target buyer persona. Consider all the touch points in a campaign not just the messaging — message, landing page, follow-up, etc. Throw your hands in the air and wave them like you just don’t care. Do email campaigns — they still work. The phone is still the most important tool for conversion to opportunity. Append your house list. Why wouldn’t you? Consumer marketers are light years ahead of B2B marketers. If you want to know what’s cutting edge, it’s them. Don’t overvalue title filters with content syndication; identifying organizational interest is the goal. P.S., Directors and VPs don’t download white papers online. You should send an email after you leave a voicemail. You will get an exponentially higher open rate. Keep marketing and generating demand in December, or you’ll end up with no pipeline in January. Understand common prospect objections and help attack them in your collateral. Create versatile content: Can you use this content in a white paper, webinar, blog post, etc.? Thanks, @scottalbro, @cjablonski, @tlotl, @mschmier, @damphoux. I had an interesting conversation the other day with a guy who wanted to blog. After telling him the level of effort necessary to have an effective blog, I could hear him deflate. If you can’t produce a good blog, you probably shouldn’t do one at all. I can tell you firsthand that blogging takes effort and time that not everyone has. Have a professional Web site: This is obvious. But in case it needs spelling out, it’s ok not to have a blog but it’s not ok to not have a Web site. Do the social networking thing: Create and update a LinkedIn profile, first and foremost. By update, I don’t just mean your work history, but treating the profile like a Web site and marketing yourself with the critical keywords in your industry. In addition, strongly consider joining Facebook. Both of them offer the opportunity for extra exposure by joining groups and networking with like-minded professionals. The microblogging sites (twitter, plurk) won’t be as effective for you if you don’t have original content to point to. Answer questions on LinkedIn Answers: I can’t speak to this firsthand, but I know a number of friends in the business who get leads and referrals because they are presenting themselves as thought leaders or experts by answering questions relevant to your industry. Don’t waste your time answering dumb general questions such as “Who in your mind is the best CEO?” unless you have time to burn – in which case you probably should be writing a blog in the first place. Comment blogging: Bloggers love when you comment, so don’t feel like you are intruding. The play here is to get on high traffic sites relevant to your expertise. So if you are a marketing guy, blogs such as MarketingSherpa, The Funnelholic, Modern Marketing, and so on will be your targets. There is unwritten etiquette here. Don’t be the dork who writes shameless plugs your products – especially if they’re bad. The key to entrance and acceptance to the blogosphere is to add value. It’s fine to add a backlink, you can include a link back, that is fine, but your comments should be insightful and relevant to the post you are commenting on. Your goal is to come off as an expert and increase visibility for your own name and brand. So, the answer is yes, you can achieve the goals of blogging without starting and maintaining a blog. The oldest link-building trick in the book is the “best of” list. But this is not merely a link-building exercise. Actually, I have been dying to write this for a while. Since I have started the blog, I have found places on the Web to gather ideas and have had a chance to really think about the people that have given me the foundation for my ideology. The bottom line is that my professional career has to have been affected by you to make the list. That’s it. There are only 19 on this list, so consider this Part I. I can’t help but find people as I expand my professional horizon. Michael Stelzner: I started reading his blog when I started mine. He’s really smart and interesting. Not surprisingly, he is a great writer and a clear-cut thought leader in what works or doesn’t work in the white paper business. Howard Sewell: This dude is a total stud. I have known a lot of people who have worked with him and believe in his work. He is known in Silicon Valley to be a guy who can deliver. So get this, I PAID to take Howard and Michael’s class on whitepaper syndication. That’s right, PAID. That typifies the kind of respect I have for them. I wish his blog posts were longer however. Stu Silverman: This guy gets WAY too much ink from me, but he was my boss, knows b2b lead generation as well as anyone, and always delivers. He’s a consultant who has built lead-development teams in the Valley for 30 years. Not a blogger, so, I have to refer you his one white paper. Spend an hour with him, and you walk out smarter. Jon Miller: You just know this dude is smart. His blog posts are insightful and Marketo (his company) is on the verge of greatness. I know a guy who is smart when I see one. I read most blogs when I remember to or feel like it. I always read his blog, Modern b2b Marketing Blog. Brian Carroll: I am a sell-out. There may not be a more famous guy in our business. And this is way too obvious choice. But, I like this guy and as an Internet guy myself, props to him for being the number 1 result on Goggle for “ b2b lead generation.” Anyway, I like his work, and he sits on top of the lead-gen world as our number 1 thought leader. Aaron Ross: This one is interesting. So, I know Aaron. He built a very successful outbound lead-generation group at Salesforce.com. But you always have to be careful as to whether companies like Salesforce.com made the man or if the man helped make Salesforce.com. The most important thing is that he built the outbound group that went after mid-size and higher opportunities, so he didn’t get to sit back and ride the Salesforce.com wave. I like reading his stuff a lot and think the guy is really smart. Also Aaron has a new business, Pebblestorm.com, which is innovative and ahead of it’s time. The guys from Sirius Decisions: I can’t choose one, I have liked everyone of them. I was introduced by my boy Matt Elders and was impressed. More and more marketing departments are using their lead-generation methodologies. That’s a good thing. The inventor(s) of Eloqua: I know they are trying to play their guy Steve Gershik up on webinars and over the internet, but I just couldn’t put him on the list yet. No offense, he just didn’t fit into my rule-set. But Eloqua will prove to be a landmark breakthrough for marketing, and all the others jumping in to play in the marketing automation game will ultimately thank these guys for inventing the category. MarketingSherpa: I love MarketingSherpa. Period. I read the reports all the time. Laura Ramos at Forrester Research: I saw Laura speak once and liked her schtick. Her stuff is good, not as “feet on the street” as some of the others, but valuable nonetheless. Anneke Seely and Sally Duby from Phone Works: I use their compensation reports in one of my posts and read them every year. Like Stu above, these gals run around the Valley building inside sales and lead-gen teams. They have a great reputation, and I love that they use the compensation reports to stay in our hearts and minds. In other words, smart. Brian Provost: Total fix here. I work with Brian, but let’s be clear: if there is a guy who has the best win percentage in the competitive b2b Internet market, its Brian. He IS SEO, not a guy who reads it out of a book, from classes, or online posts. Mike Damphousse: Mike does outbound appointment setting. He helped build up By Appointment Only and now has his own gig: Green Leads. You gotta love the brute force outbound guys, especially those willing to take all the risk and charge you per-appointment. Check out his blog. Paul Dunay: Another referral from Matt Elders. Paul has a blog that I read, and when I spoke to him I was amazed at his sophistication. You want a guy who knows what DRIP/nurture marketing is? Talk to Paul or listen to his stuff. Robert Rosenthal: I like guys who write their blogs with curse words and raw opinions. His blog approach is close to mine, written like he talks and fun. LinkedIn Answers: This is obviously not a person. Maybe I could have listed their CEO, but since I think he should have sold the company last year when he had the chance, I’m not going to give him any props. I can however, sit back in awe of the greatness of Linkedin Answers. I use it, other smart people are on it, and the answers you get are awesome. The b2b lead blog: I just started reading this blog. The posts are interesting and witty. Also, they are prolific, so I get new content from them ALL the time. Tamara Gielen: She has a great email marketing blog, BeRelevant!. I particularly appreciate blogs that are easy to read and have practical advice. This is one of them. Denny Head: Denny has just started a consulting business, but I saw what he can do when he was with Avaya. He built a lead-processing machine there that is bar-none one of the best I have seen. Now he is selling his secrets. This was fun. As I mentioned, 19 is not a lot, so stay tuned for more. I can’t get off the linkedin.com tip…sorry. So, what I have done is create a linkedin group, Friends of the Funnelholic. Click here to sign up. I hope to use it as a way to reach out to friends and other fans of B2B lead generation. 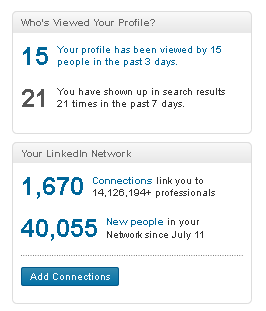 Is my beloved linkedin.com going to get gobbled up by Fox? I promised I wouldn’t talk about linkedin.com until the Valleywag article about Linkedin CEO Dan Nye mouthing off about their valuation because Murdoch and Fox wants a piece of them. Will they stay or will they go? If Nye has his say, itll cost someone a pretty penny. Bold, very bold. I was not going to do anything about this post but since Matt Dickman from Marketing Profs had done a nice job including a youtube video…I had to mention it. Nothing new here, since I have been writing about it alot and saw the post, I figured I owed mention!